The Arctic Fox (Alopex lagopus) is found in treeless coastal areas of Alaska from the Aleutian Islands north to Point Barrow and east to the Canada border. Both blue and white color phases occur, with the blue phase more common on the Aleutian and Pribilof Islands. The white color phase is more common in northern litters. Young of each color phase may occur in the same litter. Fully grown Arctic Foxes weigh from 6 to 10 pounds. They average 43 inches (109 cm) in length including the tail. Their tails average 15 inches (38 cm) in length. Their short legs and body, short ears, and dense winter fur give them a stocky appearance compared to their relative, the red fox (Vulpes fulva). Arctic foxes molt twice each year. The white foxes begin to shed their long winter fur in early April. By late June the face, legs, and upper parts of the body are covered with short, brown summer fur. The fur of the lower sides and abdomen is yellowish-white. The change to winter pelage occurs in September and October. By November the luxurious white winter coat is complete. Foxes of the blue phase remain dark or charcoal colored year round but become somewhat lighter in winter. Arctic Fox pups are born in dens excavated by the adults in sandy, well-drained soils of low mounds and river cutbanks. Most dens have southerly exposure. They extend from 6 to 12 feet underground. Enlarged ground squirrel burrows with several entrances are often used as dens. Mating occurs in early March and early April. Gestation lasts 52 days. Litters average seven pups but may contain as many as 15 pups. Arctic Foxes are monogamous in the wild. Both parents aid in bringing food to the den and in rearing the pups. Pups begin eating meat when about 1 month old and are fully weaned by 1 1/2 months. Pups begin to emerge from the den when about 3 weeks old and begin to hunt and range away from the den at about 3 months. Family units gradually break up during September and October. During midwinter, foxes lead a mostly solitary existence except when congregating at the carcasses of marine mammals, caribou, or reindeer. Arctic Foxes attain sexual maturity at 9 to 10 months, but many die in their first year. In summer, Arctic Foxes feed primarily on small mammals, including lemmings and tundra voles. Foxes denning near rocky cliffs along the seacoast often depend heavily on nesting seabirds such as auklets, puffins, and murres. When food is plentiful, it is sometimes cached among boulders and in dens for later use. Arctic Foxes are omnivorous. They sometimes eat berries, eggs, and scavenged remains of other animals. Many foxes venture out onto the sea ice during winter to eat the remains of seals killed by polar bears. Arctic Foxes may move long distances over sea ice. A fox tagged along the coast of Russia was captured near Wainwright, Alaska, a year later. 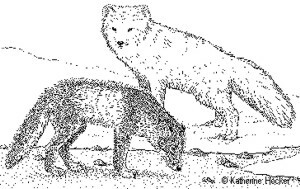 In areas where lemmings and voles are the most important summer prey, numbers of foxes often rise and fall with cyclic changes of their prey. Fewer pups are successfully reared to maturity when food is scarce. There is evidence indicating that competition for food among young pups accounts for some of the heavy mortality in this age group. Arctic Foxes are abundant in many areas. Their numbers do not seem to be greatly affected by trapping. In the past 50 years, the annual harvest of white foxes in Alaska has ranged from a high of nearly 17,000 in 1925 to a low of 500 in 1956. The average is about 4,000 pelts per year. The demand for Arctic Fox fur has diminished in recent years, but the sale of their pelts is important to the economy of many coastal Native villages. Arctic Foxes are generally less wary of humans than their near relative, the red fox. They sometimes become nuisances around settlements. They are susceptible to rabies and can transmit this disease to humans. Foxes that approach humans without hesitation may have rabies and should be killed and submitted to health authorities.